The Federal Reserve Bank System is divided into 12 District banks, each of which operates under the guidance and leadership of a bank president both elected by the District’s Board of Directors and approved by the Board of Governors of the Federal Reserve System. The president also serves as a member of the Federal Open Market Committee (FOMC), the System’s principal monetary policymaking body. 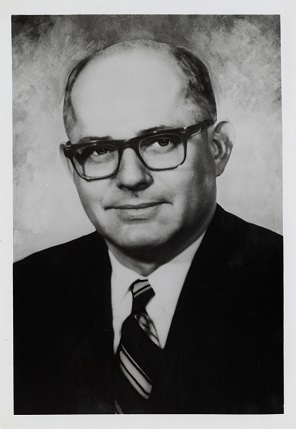 Darryl R. Francis served as the seventh president of the Federal Reserve Bank of St. Louis from 1966-76, overseeing and directing Eighth District Bank functions. Francis’s tenure as president fell within the Great Inflation, the macroeconomic period of the twentieth century lasting from 1965-82 that included no less than four recessions. Francis’s views on inflation differed from other Federal Reserve officials, leading to his reputation as a non-conformist and to the St. Louis Fed’s reputation as a maverick bank within the system. Born in 1912 in the small town of Ridgeway, Missouri, Darryl Francis focused his college education and early career on agricultural economics. After some stints as an agricultural economist at the Federal Reserve Bank of St. Louis and as a commercial banker in both Memphis and St. Louis, Francis rejoined the St. Louis Fed in 1953. He worked his way through positions such as branch manager and vice president until his appointment as St. Louis Fed president in 1966. FRASER contains many items that explore Darryl Francis’s advocacy to halt inflation, the St. Louis Fed’s reputation as a maverick for its dissenting beliefs, and Francis’s continued interest in agricultural economics. For example, in a 1994 audio interview with Richmond Fed historian Robert Hetzel, Francis recounts several stories and shares his impressions of Federal Reserve Chairs William McChesney Martin Jr. (1951-70) and Arthur Burns (1970-78). The Chair is the active executive officer of the Board of Governors of the Federal Reserve System, and also serves as Chair of the FOMC. In this interview, Francis recalled that Martin “listened to what everybody else had to say before he put himself on the line” at FOMC meetings, while Martin’s successor Burns always spoke first so that attendees would “know where the hell he stood.” Francis also recalled that Burns did not like the St. Louis Fed’s position that “high rates of money growth had caused the burst of inflation” in the early 1970s. This view of the economy led to the use of the term “maverick” by the press when referring to the St. Louis Fed. Former Cleveland Bank president Jerry Jordan’s 2002 speech “Darryl Francis: Maverick in the Formulation of Monetary Policy” offers an overview of Francis’s policy beliefs. Additionally, a detailed, historical account of the St. Louis Fed’s history can be found in the 2013 annual report titled 100 Years of Service. During his presidency, Francis traveled around the country and spoke extensively on topics such as inflation, monetary policy, and agriculture, a subject he always kept at heart. More than one hundred of Francis’s speeches, scanned from the original documents in the archives, are available for viewing on FRASER. Other Francis documents of interest on FRASER include the official press release of Francis’s appointment as vice president of the Federal Reserve Bank of St. Louis, minutes of the meeting of the Board of Governors where they approved Francis’s appointment as president, and William Poole’s eulogy from Francis’s 2002 funeral in Fort Smith, Arkansas, where Francis lived after his retirement from the Fed in 1976. William Poole, president of the Federal Reserve Bank of St. Louis at the time of Francis’s death, remarked that long before he ever met Francis in person, he “knew him very well by reputation.” Francis’s outspoken economic views, largely documented by his catalog of speeches, help secure his permanent and prominent position in St. Louis Fed history. For more information about Darryl R. Francis, please see his official biography on the Federal Reserve History website. “Maverick in the Fed System.” Business Week. November 18, 1967: 128-34.